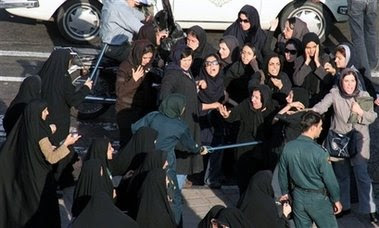 Iranian Women Protest For Rights- Get Public Flogging Instead! …But, instead of more rights, the women were given a beating by the Iranian regime. Now, the Iranian authorities are trying the women for “plotting against state security” and sentencing them to jail. Three of the women will be flogged. Their crime was protesting for womens rights. Tehran, 26 July (AKI) – The trials of 31 feminists arrested on 3 March for having organised a sit-in in front of the Revolutionary Court of Tehran have resumed in the capital. The womens’ rights activists are this time being tried individually and accused collectively of “seditious meeting” and “plotting against state security”. The first ten have been given jail terms of between six months and five years, of whom three are also to be flogged. Most of the women received suspended sentences. Only one woman, Behareh Hedayat, remains in jail but not for her activities in defence of womens’ rights, rather for her role in the executive of the students association of the Amir Kabir Polytechnic. While being sentenced to jail for demanding sexual equality and equal rights in the Islamic Republic may be considered “normal” public flogging, a punishment to date reserved for political crimes, is not. The last three feminists judged by the Revolutionary Court, Delaram Ali, Alieh Eghdam and Maryam Zia, as well as jail terms, were punished with 10,20 and 10 lashes of the whip respectively. “This is an unprecedented and worrying development” commented Yousef Molaii, Maryam Zia’s lawyer. Iranian Nobel peace laureate, lawyer Shirin Ebadi, has appealed to the United Nations. In a letter to the UN Human Rights Commission she defined the public flogging of women demanding equal rights and protesting against polygamy as not only a violation of Human Rights but also an act of incivility . 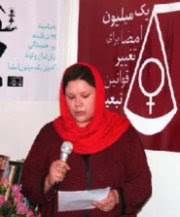 Prominent women’s rights defender, Delaram Ali was sentenced to 2 years, 10 months jail term and 10 lashes, on 2 July 2007, for her participation in a peaceful gathering of women human rights defenders in Tehran in June 2006- Delaram Ali Blog.